Texas Housewife: Step Away From The Candy! Step Away From The Candy! Okay y'all, I have a problem. Clearanced Christmas candy. It's so cheap! And chocolaty, tempting, and down right delicious. I've bought more of this stuff than I should have. But, it's such a good deal! Initially I thought I'd buy lots, stick it in the freezer, and have it for months. But, very little of it has gotten into the freezer. WE are eating it...eating way too much of it. So, am I the only one guilty of this? Do y'all take advantage of these great after Christmas sales? Do you eat way too much of it before it makes it's way to the freezer? Also, how do you store it? For instance, I know that chocolate will freeze well, but what about a filled chocolate like Rolos?I'd love to hear your input on this. 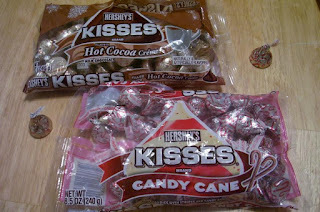 In the meantime, I'm off to hide Hershey's Kisses in the freezer. And my neighbor comes over and eats it. Helps me out that way. With so many in and out here I find that most of the time candy is quite welcomed. And I do good if I have it. It is when there is NONE that I start having cravings. So it is actually better for it to be here than not. Oh, I always buy clearance candy! We have a ton here too! I don't bother storing it, I basically eat it all. Sorry. I think it's okay for a month or so. I love clearance candy too. Unfortunately, once it's in the house I feel like I have to eat it. And eat it. And eat some more. Since I obviously have no self control I have forbidden myself to buy it.